You know, sometimes however rare, there are movies that I distinctly remember as being meh – even almost terrible, that when I rewatch it, I’m typically shocked to find that I liked it. When I watched Mr. Bean’s Holiday back in 2007, I remember thinking it lacked significantly in what I like about Mr. Bean, and definitely thought it didn’t measure up to the first film ten years before. I can say, however, that rewatching the film once again shocked me to find just how much I liked it…in fact…thought it was even better than the original film. Both films clearly have their positives and negatives, but I’ll try to explain why this comes out a victor. Mr. Bean is back and is on vacation. After winning a random vacation to Cannes, France, Bean sets off with his special video camera and plans the best adventure of his lifetime…which is what he gets…and more! Along the way, he runs into a boy who lost his father, so he attempts to help the boy locate his father…but along the way they split up and Bean runs into Sabine, an actress with dreams higher than the nearest mountain. Mr. Bean must find a way to help both the boy and this actress achieve their dreams. I really like the 1997 movie because there is this dynamic shift between the pantomiming methods of Rowan Atkinson and the American comedy of the rest of the cast who has the ability to speak. Bean in America was this nice sense of a fish-out-of-water, and it felt really nice, and ended up being pretty funny. The problem with the first was that it seemed to be more or less another opportunity to do a bunch of tiny little skits strewn together throughout the film. All in all, it didn’t feel completely natural, and it did lose a little of that Mr. Bean spirit we love from the show. Then again, how do you make a movie exactly like his show, but full-length? I don’t really know how to answer that, but I think the sequel found a pretty good answer to that. Even though Rowan Atkinson is clearly showing his age at this point, he can still play Mr. Bean amazingly well. His pantomiming is still great, and he can still tell an amazing story. There are still these little skits strewn throughout, but a lot less and more separated from the original, making this film already feel like a movie. Not only that, but I felt the spirit of Mr. Bean come back to life in this film. Tell you the truth, I liked the chemistry Mr. Bean and the Americans had in the original, but nothing matches the chemistry in this film. These characters that Mr. Bean runs into somehow fit Mr. Bean better than the original film. His connection to these people are astounding. Like Mr. Bean, they both have to rely on body language to talk because they all speak different languages, and signals are mixed. So yes, it is just as funny in certain parts. I guess when I first watched it, my mind was too set on the original film that I missed that this worked in spirit closely to the original show. Beyond that, the music is awesome, seriously. I watched both films today, and I can’t even recall any real music in the original, other than something by the Beach Boys. The actual OST from this film is done so well, and it fits Mr. Bean like a glove. Also, the scenes in this film are downright beautiful. I’m going to have to say that Mr. Bean’s Holiday is an underrated flick, and I’m guilty of rating it bad before too. All I have to say is to rewatch it if you’ve already seen it. Give it another shot, and try to remember Bean’s roots. 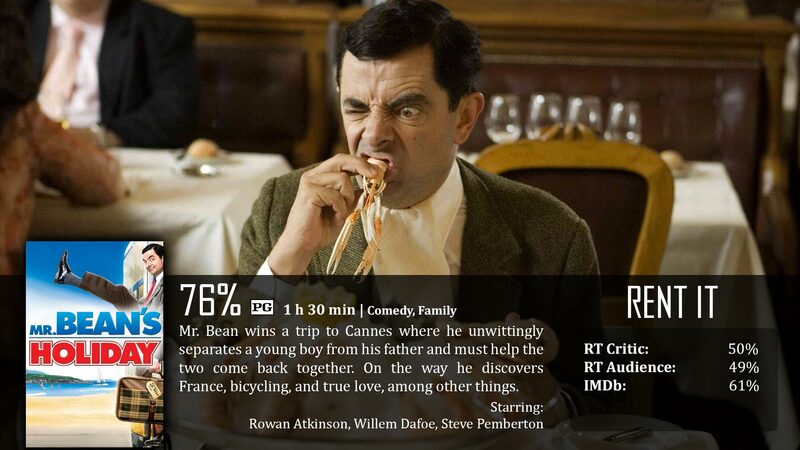 Again, Rowan Atkinson is Mr. Bean. His chemistry with the boy and the girl are so memorable, and even though you probably don’t know the other actors in this film, they do such a phenomenal job giving the film heart and a unique view. The movie just isn’t as memorable as the first film for whatever reason. Some of the jokes don’t work as well, and Rowan Atkinson is visibly getting too old for the role. Then again, he was much older at the Olympics, and his skit was just amazing. Waitress on Train: You speak very good French.